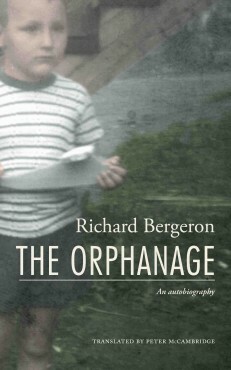 In Books Tagged In Childhood, Orphanage, Projet Montréal, and Richard Bergeron. “I was a big boy. Soon, I would be four years old. The four of us—the four oldest—were in the back seat of our father’s car. The baby was just six months old. He wasn’t with us. Though both parents were alive, Richard Bergeron and his four brothers became orphans and lived in an orphanage for five years? It was in 1959, five floors of dormitories at fifty children a floor, with Nuns’ cells on each floor. In this tale that will have you laughing and crying, Richard recalls that, “as in all concentration-camp systems, daily life is dull and repetitive.” Some get up, make their beds, say their prayers, while others line up for the strap. It’s just routine. “All concentration-camp systems are alike,” recalls Richard Bergeron in this short but moving story: daily life was dull and repetitive. It can be fun, tolerable, or unbearable. But Richard Bergeron’s tale does not settle old scores or vent bitterness. It simply recounts how he began the rest of his life. Richard Bergeron leads the Montreal party Projet Montréal and has twice run for mayor. An architect and an urban planner, he has written five books published in Quebec and in Europe. He is a Montreal city councillor. Richard Bergeron has travelled widely, particularly in Africa. His doctoral thesis in urban planning focuses on housing policy in Abidjan, Ivory Coast.